As you know,Misha is an incredible curious dog. She just can’t help but get herself in the middle of everything. That makes wrapping presents a challenge. Santa’s Helper in the House! 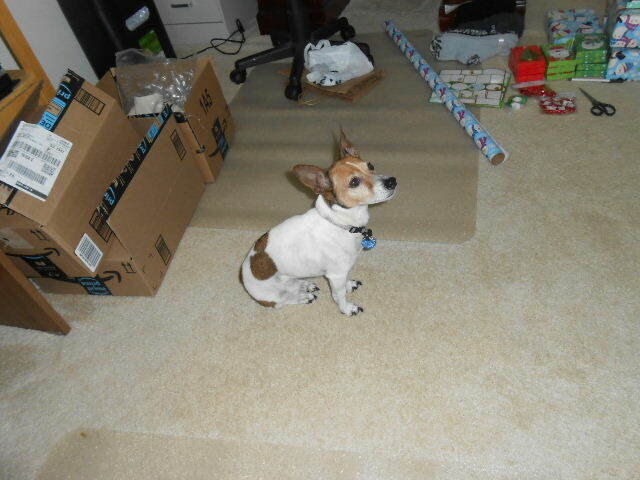 This is what it is trying to wrap presents with my dog. It is like having a 4 year old around. 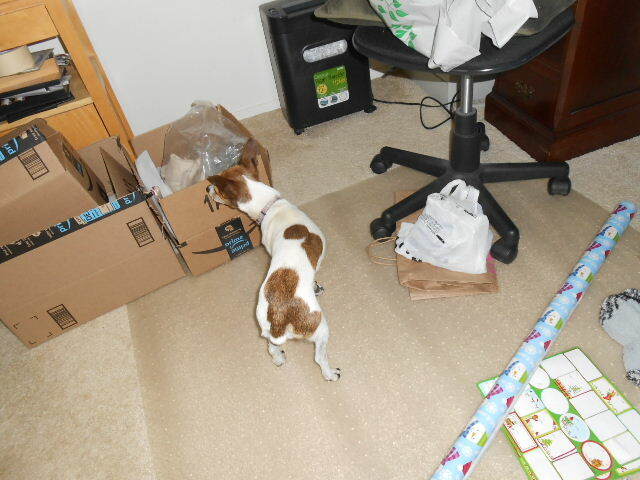 Misha makes sure the wrapping supplies are in order. Don’t want any birthday paper going on Christmas presents, now do we? She’s always got your back. 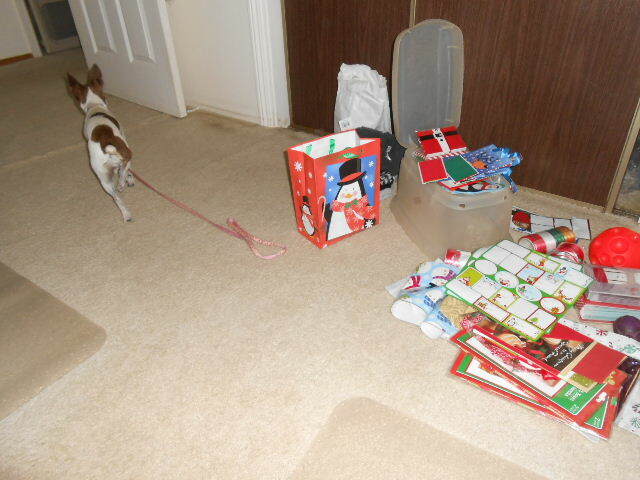 She has made three unsuccessful attempts to get her present out of a bag. She is giving me that look, but it’s not working. Does your dog like to help out too? Does your dog have to be in the middle of the action like Misha? We aren’t real interested in wrapping packages, but our kitties sure are. They cause a lot of trouble. Emma, Maybe I have a little bit of cat in me. I just can’t keep my nose out of the gifts! Annie has a fear of tape and freaks out every time she hears the tape or the ripping of paper. It makes for an interesting process. Katy really is pretty uninterested. It’s funny because Misha is afraid of many things including the roll of mailing tape, but she isn’t afraid of scotch tape. She was, however, scared off when I pulled the tape off the shipping box. Oh gosh that’s precious and I 110% relate. 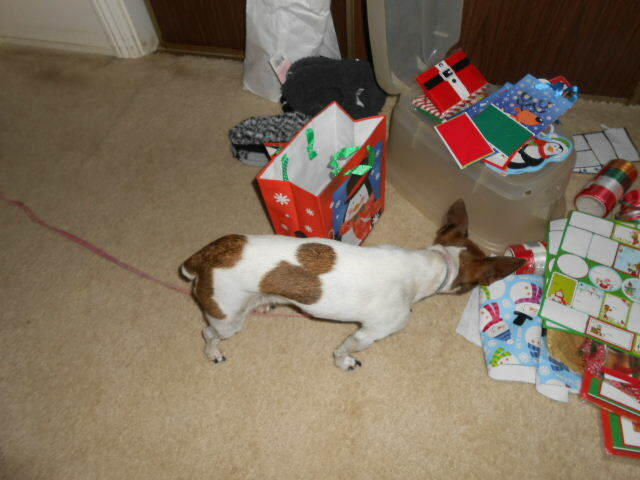 Button, my rat terrier, is the exact same way. Always wanting to know what’s going on. I jokingly call her Inspector Button. Terriers must be born with an extra curiosity gene. I’ve never owned a dog as nosey as Misha. She just as to be in the middle of everything. Sounds like Inspector Button is the same way! Misha looks like a good helper. I would be too scared to have that much paper on the floor for our Doods to destroy. She does try to help. Now if I could just train her to put a paw on the paper and hold it down while I get the tape, she could be my assistant. If there’s no treats or goodies – they won’t usually be interested. At least not in my house. Misha is not discerning. LOL She does have her alert system on in case food enters the area. But, she likes sticking her head in any bag that comes in the house.